Rosarians dream of perfection in performance of their roses. Much time, labor and money is involved in planning our rose gardens - future gardens and revitalizing our present ones. Many people buy a new rose bush, put it in a freshly prepared hole and it goes down hill in a year or two. You are ready to dig it out and try another rose, only to repeat the same scenario again. To solve this dilemma, it could be the soil pH. Almost everything we add to our rose beds tend to lower the soil pH. It only takes a couple of years for our soil pH to get out of balance unless we do something about it. Have you had a soil analysis recently? Roses do best in soil of pH 6.5 to 6.8. If you are in doubt about your soil, now is a good time to get it analyzed. Dig down in the rose bed about eight inches with a trowel or shovel (be careful not to damage rose roots). Go through the rose bed four to six different areas - both ends of the rose bed, both sides of the bed and a couple of other areas in the rose bed. Mix the dry soil and place in a plastic bag. Arrange to bring the sample to your local extension office for analysis. 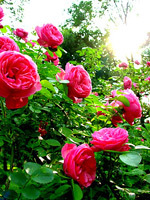 Selecting good healthy plants is important for successful rose growing. Roses are available through catalogs or garden centers for spring planting. Plants should be free of disease and insects. Canes should be thick and healthy. The rose bed should receive full direct sunlight for a minimum of six hours daily. The more sun the better. If shade is unavoidable, afternoon shade is best. The morning sun is necessary to dry dew from foliage. If the rose leaves remain damp for long periods of time, fungal diseases will develop. To reduce the incidence of disease, the bed should have good air movement. Avoid planting roses near shrubs or hedges that block air movement as well as compete with the rose for sunlight, soil moisture and nutrients. Another requirement for a rose bed is good drainage. Roses tolerate a lot of water, but sitting in water is not good for the rose bush. Dig a hole two feet in depth. Fill the hole with water. If the hole drains completely in an hour, then your drainage is okay. If the water does not drain, you have poor drainage. Dig down about 3-4 feet and add gravel to the hole. Amend the soil with humus, compost, dried cow manure or pulverized tree leaves. Roses should be planted in the spring, after March 15th, or as soon as weather and soil conditions are favorable. Never work wet soil. When preparing the soil, spade the entire rose bed to a depth of two feet. Remember to dig the hole large enough to plant the new bush. You don't want to crowd the plant in a small hole. Add organic matter such as dried cow manure or compost. Before planting, soak the entire bare root rose(s) in water for 24 hours in order to add moisture to the roots and canes. Now, add eight ounces of phosphorus at the bottom of the hole before planting the rose bush. Phosphorus promotes root growth. Once you have added phosphorus, build a small cone of dirt in the hole - plant the bare root rose over the cone so the roots are spread out. The union bud or graft union should be planted an inch below the soil line. This protects the bush during our cold winters. Water the new bush thoroughly. Then continue to add soil in the hole and also cover with soil the entire bare root rose. This protects the canes from rapid drying due to wind, etc... Continue to leave soil around the bush until you notice leaves appearing from the soil. At that time you can gently remove soil with your hand or a small stream of water from the garden hose. Be careful that you do not break off any new growth on the bush. Dig a hole 2 feet deep. As noted above, add water to the hole to check for good drainage. If drainage is good, add 8 ounces of phosphorus to the hole. 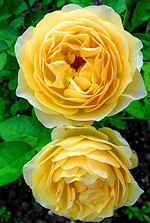 As mentioned with bare root roses, phosphorus promotes root growth. Remove the container and place the rose bush with soil into the hole. Be careful not to loosen the soil around the new rose bush you are planting. Water thoroughly. Fill the hole with soil, cow manure or compost. Plant the rose an inch below the union bud or graft union. You do not build a cone when planting a rose in a container. The roots are already growing in the container and leaves are already growing. 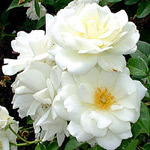 Do not fertilize bare root or newly purchased container roses. Roots could easily be burned. Fertilize the new roses after their first blooming and the need to cut off the old spent blooms. After a long, bitter cold winter, many rosarians are anxious to get outside and work with their roses. Modern roses - hybrid tea, floribunda, grandiflora and miniature should be cut back (pruned) and fertilized around April 15th. Cut the canes at a 45� angle to the "green" portion of the rose cane. In many cases you may not see any green canes. They are dead canes. If the canes are black cut them all the way to the soil. When they do start growing you may want to cut back some of the small canes (less than the size of a pencil) and leave about 5 or 6 canes to grow. This will promote larger canes and larger blooms. Otherwise, you will have small canes and small blooms. Once you have cut back the old canes, make a shallow trench around each rose bush with a trowel or your hand. Apply 8 ounce cup of 13-13-13 granular fertilizer to each plant. Water in fertilizer thoroughly. When you are through, go back and water again. Your objective is to see that the fertilizer has dissolved and worked down toward the root area. When you are finished watering, go back and cover up the shallow trench with your hand. Fertilization of roses is a must to encourage production of large, vigorous basal canes. These are the new canes that are formed at the base of the union bud. If a cane from the rootstock appears, this is called a "sucker" and has much smaller leaves. The cane should be broken off at the union bud as soon as you see it. When you notice new leaves on the bushes, start your weekly spray program. Use a fungicide every week. You may need only a one or two gallon spray container. Read the instructions on all chemical containers before using. A morning spaying routine is best but you can spray late in afternoon if necessary. For best long-term results, use one fungicide every week for three weeks of each month. Then use another fungicide on the fourth or last week of each month. When you notice insect damage on the leaves or blooms of your roses, add an insecticide to your weekly spray program - usually the first part of May. The fungicide and insecticide can be added in the same container and sprayed together. As always, carefully read directions on your chemical containers. Roses should be watered or have moisture in the soil before spraying. If the soil is too dry you could burn the rose leaves. Rose growing pays big dividends in beauty and satisfaction to the grower. It seems like hard work but it is well worth it.